MJ Pak, Medical Doctor analyzes the 2018 Kim Jongun-Trump Submmit at Sangapore and he concludes saying "we have the Singapore Summit Agreement, which will provide needed legitimacy and commitment to power the engines of peacemaking. Hard work is ahead for those behind the scenes in crafting the diplomatic, economic and military agreements needed to support and advance the spirit of the Singapore Summit. But with an application of political will, which both leaders seem to have, getting to peace is now possible. It may be that the missing ingredient has been found." For Koreans everywhere, 2018 has already been an epochal year. In a matter of just a few months, the joint cooperation of North Korean Chairman Kim Jong-un, South Korean President Moon Jae-in, and U.S. President Donald J. Trump relieved 70 years of enmity and tension and has perhaps resolved the stalemate of Korea’s division. The first initiative came from Kim in the form of his New Year address in January, which contained many surprisingly conciliatory statements. This was followed by the North’s very active participation in the PyeongChang Winter Olympics. Shortly thereafter, a quick exchange of North and South delegations resulted in the first summit between Moon and Kim, which produced the Panmunjom Declaration of April 27. Among other joint intentions of the two Koreas, the declaration basically affirmed the historical fact that “Korea is one”. Kim’s initiative is a result of the national policy he promulgated after assuming the leadership of North Korea, when only in his late 20s. The policy, called the Parallel Progress Policy, puts the national emphasis on both defense and economic development. Embargoes, sanctions, and military threats directed at North Korea by the U.S. and South Korea have isolated the country. From the North Korean point of view, it had to emerge as a credible and equal negotiation partner, with the ability to enforce agreements from its former enemies. North Korea’s tactic was to develop a nuclear weapon with the means of delivering it to enemy countries. The ultimate goal of its frantic efforts during the past two years to develop nuclear capability was a prelude to the negotiations for peace on the peninsula. Simultaneous to Kim deciding he was ready for peace talks, President Moon Jae-in was elected president in the South. He came into power in a wave of uprising against the corrupt and arch-conservative regimes of Lee Myung-bak followed by Park Geun-hye. The uprising, called November Revolution, swept the liberal and highly-respected Moon Jae-in to power. Together, the two established the Panmunjom Declaration, that delineates the commitments of both sides on issues of reconciliation, reunification, de-militarization, multilevel-communication and economic cooperation, and finally the implementation of agreements made previously between the two Koreas in 2000 and 2007 (the so-called 6-15 and 10-4 Agreements). The two Korean leaders knew they needed concurrence from the U.S. to implement the ideas contained in the Panmunjom Declaration. There are many ties between South Korea and the U.S., including military cooperation, treaties and agreements. There is also the 70-year era of distrust and hatred between the U.S. and North Korea that had to be dealt with. Moon took action to coordinate the summit between Trump and Kim. The presence of Trump in the White House is another serendipitous event from a Korean point of view. Notwithstanding his apparent instability and lack of firm principles on many matters, Trump is a deal-maker who appears to be genuinely interested in achieving peace and stability in the Korean peninsula and in Northeast Asia. He also knows that such an effort would give him credit and recognition. He immediately expressed interest in meeting Kim with the goal of resolving various peninsula issues. After some initial turmoil, the Singapore Summit between Trump and Kim finally took place on June 12. There was a great deal of publicity and fanfare, and it was generally regarded as a tremendous success for both leaders personally, as well for all Koreans. The final agreement signed by both leaders was rather brief, about 450 words long, delineated four important key points, but lacked specifics of implementation. The four points were: 1)North Korean commitment to complete peninsular denuclearization; 2) U.S. commitment and guarantee for the security of North Korea; 3) Return of the remains of U.S. war dead; and 4) Temporary cessation of the U.S.-South Korea joint military exercises (war games) which have been held for many years in disputed territorial waters off North Korea’s coast. There was an immediate positive effect of the summit in the public image of the two leaders meeting cordially, appearing together, and in the remarks made by Trump about Kim. However, after the cordial meeting comes the hard work by both administrations to establish a formal mechanism for implementation of the Agreement terms. This is essential for normalization of the U.S.-North Korea relationship and for the realization of the Panmunjom Declaration. My perspective as a Korean American with a passion to see the realization of the objectives of both Summits and a future of peace and reunification on the peninsula, I would suggest the following as recommendations for both sides. The U.S. and North Korea should establish permanent Liaison Office of each other in Washington, D.C. and Pyongyang staffed by high level diplomats from both countries, along with personnel representing, military, economic and cultural expertise from each side. At the same time, the two nations should establish a Task Force composed of engineers, nuclear scientists, economists and diplomats from both sides. The purpose of the group would be to research and develop a detailed timetable for the peninsular denuclearization, and plan for the normalization of the diplomatic, economic, political and military relationship between the two countries, including crafting a peace treaty between the U.S. and North Korea. The product of this would be a multi-year implementation schedule that both countries can agree to and follow. The U.S. should recognize, accept and honor the Panmunjom Declaration of the two Koreas especially its basic principle,“Korea is One”, by recognizing and declaring that the sanctions, embargos, and other trade and diplomatic isolation currently enforced on North Korea by the U.S. and UN no longer apply between the two Koreas, since in principle, they are one country. With such agreement, the two Koreas could immediately communicate, trade, exchange and in other ways interact, especially on humanitarian issues. This would include sending food aid, and medical supplies, cooperating on family reunions and other joint activities unencumbered by the current sanctions. In addition to dismantling of the Pung Gye-Ri nuclear test site and missile test site, North Korea could immediately announce a significant reduction of its 1.25 million troops. This military force, when combined with the 0.625 million South Korean army, creates an army of 1.9 million, which is fifth in the world in size after India, China, Russia and the U.S. (a ridiculous statistic!). North Korea should also announce the immediate disarmament, i.e. unloading of its 20,000 long-range artillery guns, which have been deployed, fully loaded, along the DMZ, and aimed at South Korea. Finally, it may just be a symbolic gesture, but North Korea should also announce the return to the U.S. of the U.S. navy ship Pueblo that it has held since its capture in North Korean waters in 1969, perhaps to the city of Pueblo, Colorado, USA. Due to the nearly 70-year of division of the peninsula, the animosity between the two Koreas and the development of a complex political/economic relationship between the U.S. and South Korea during this period, many issues need to be resolved between the two nations to facilitate a proper and realistic implementation of both summit agreements. Of these, the one of most obvious problems to be solved, which got an airing at the Singapore Summit, is the U.S.-South Korea joint military exercises (or war games), held annually off the coast of North Korea. At the summit, Trump supported the idea that these exercises should be permanently ceased. Approximately 28,000 U.S. soldiers are stationed in South Korea, many with their families. There are approximately 90 U.S. military bases, small and large, in South Korea. With the cessation of hostilities between the two Koreas, the U.S. should plan for troop withdrawal and base closures, and the U.S. and South Korea should review the need for a military alliance existing between the two countries currently. Additionally, the U.S. should reconsider the deployment of the THAAD (Terminal High Altitude Air Defense) missile systems in South Korea, which South Korean citizens have protested against. Assuming that the Summit Agreements hold and the strategy to implement them moves ahead, the purpose of this missile system has been obviated. Finally, there is the matter of the “Wartime Operational Control” agreement between the U.S. and South Korea. This agreement, in place for many years, hands over control of South Korea’s military to the U.S. in times of war. It also needs to be redressed in light of new cooperation of South and North, and drastic changes that will come about as a result of the Summit Agreements. President Moon is the only head of a country in the world, who has no control over his own national defense force in times of war, a situation that must be remedied. Lastly, in the course of the Singapore Summit Agreement implementation, Trump and Secretary of State Mike Pompeo may wish to improve the image of North Korea with the American public. During 70 years of animosity between the two countries, the North Korean leader, and North Korean society and political doctrine have been demonized in our society. 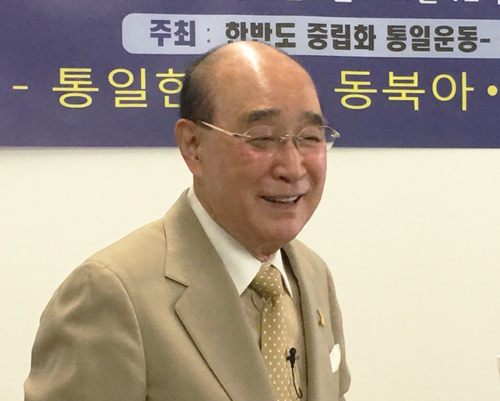 The emergence of many defector’s eyewitness testimonies of their human rights violations in North Korea have added to the negative image of North Korea in recent years. In imagining a future of peace in the Korean peninsula, we must keep in mind that there have been times, for example, during the Clinton administration, or before that, during the Carter Administration, when active cultural and professional exchanges happened between North Korea and the U.S. In 2000, North Korean Vice-Marshal Cho Myong-rok hand-delivered a letter to President Bill Clinton to ask him to engage in negotiations with North Korean leader Kim Jong-il; Secretary of State Madeleine Albright was thereafter dispatched to visit Pyongyang in the waning days of Clinton’s administration. In 2007, the New York Philharmonic performed in Pyongyang, and during those years, many cultural and professional exchanges between the U.S. and North Korea were ongoing. Perhaps the time has come to revitalize multilevel cultural exchanges between the two countries. Indeed, a review of recent history will show that North Korea has not been in opposition to peacemaking, and the U.S. has also made steps toward peace over the years. However, despite intermittent efforts at engagement in the cause of peace, the recipe for peacemaking has been incomplete; the missing ingredient has been the political will to see it through to the end. However, now we have the Singapore Summit Agreement, which will provide needed legitimacy and commitment to power the engines of peacemaking. Hard work is ahead for those behind the scenes in crafting the diplomatic, economic and military agreements needed to support and advance the spirit of the Singapore Summit. But with an application of political will, which both leaders seem to have, getting to peace is now possible. It may be that the missing ingredient has been found.